I have a new friend. Their name is Tabby Brown. Who exactly Tabby Brown is remains a mystery to me. I was greeted with the cutest envelope in my mailbox yesterday, obviously written in a child's handwriting. 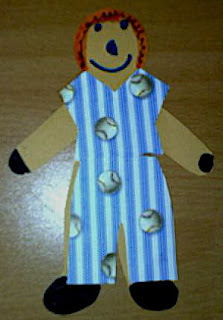 When I opened it, it was a class project about Flat Stanley (who is in the picture). This class project is to see where Flat Stanley can go. I am supposed to mail a postcard back to Tabby's school and forward Flat Stanley on to someone else. I definitely will participate in this class project, as I can't deny anyone who writes me in cute little handwriting. But as to who Tabby Brown is, I still don't have a clue. Anyone know this child? And on a side note, if I forward Flat Stanley on to you, you better participate in the project too! this guys is pretty cool! I think Flat Stanley wants to go snowboarding and 2 pint night! I think Flat Stanley wants to go to Cambodia and ride an elephant!!! I would be glad to take him with me.